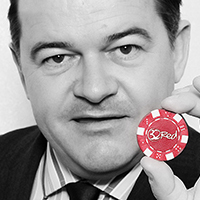 In 2002 Ed Ware founded Gibraltar-based online casino 32Red. He remains chief executive officer and creative driving force behind the firm, with responsibility for day-to-day operations. Before that he worked for almost 15 years at Ladbrokes, during which time he served as regional director of operations for three years and managing director of Ladbrokes International for two. As an avid gamer himself, he has said it is his personal mission to create the best online gaming experience on the net.